Costco.ca has an incredible deal on a knife/sharpener set right now! 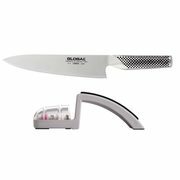 The Global 2-Piece G2 Chef Knife and 220 Minosharp Sharpener is just $79.99. The same set sells for $184.99 at BestBuy.ca and $142.49 at Cookstore.ca. The knife is 7.9 inches (twenty centimeters) with a stainless steel handle. The knife is made from CROMOVA 18 high-carbon stainless steel. Fans of the knife say it's super-sharp and durable. A Costco membership is not required to shop online at Costco.ca, and shipping is included in the list price. If you're buying anything else (or want to pick up more than one knife) and you're a Costco member, consider using the Masterpass deal -- that will take $20.00 off online orders of $100.00 or more when paying with Masterpass.